The body of this crab is made from custom blended wool to give the fly a mottled appearance. You’ll love the way that this fly sinks through the water and lands in a defensive crab position on the flat. When needed, a slight strip will give it just enough motion to draw the attention of your fish. The body of these flies is about the size of a U.S quarter dollar -- maybe a bit larger. Target Bonefish, Permit, or Redfish. 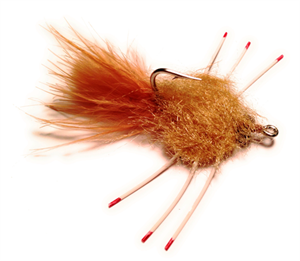 Try this fly when the fish have seen too many Del Brown's Permit Crabs.